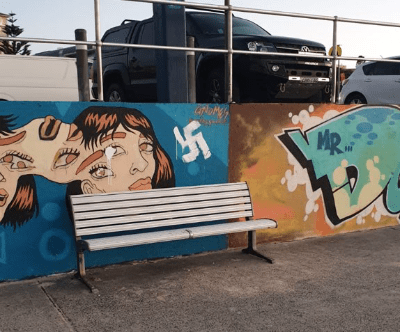 A Waverley councillor wants a bipartisan move to CCTV cameras to monitor the promenade above Bondi Beach where its famous art wall has been daubed by swastikas yet again. Leon Goltsman told J-Wire that focus has been up until now to check nighttime swimmers. He told J-Wire: “This is the second daubing of the art wall and I am putting it to council that there must be more attention paid to the promenade. Waverley Council removed the swastikas within an hour. NSW Interim Opposition Leader Penny Sharpe expressed her solidarity with the NSW Jewish community. On behalf of NSW Labor, Ms Sharpe officially condemned the attacks. It is believed that the first incident occurred on February 9 and the second one on the morning of April 17. 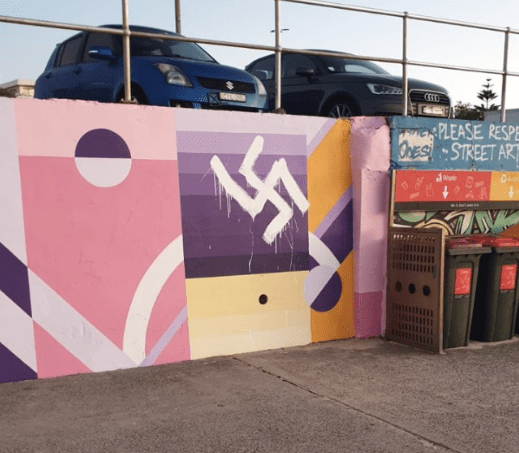 “Just days before Passover (Pesach), it is deeply disturbing to see this hateful expression of antisemitism in one of the most public places in Australia,” Ms Sharpe said. She added: “This is not just an act of vandalism, it is a clear and calculated hate crime aimed at causing maximum harm and offence. These appalling acts have no place in our society. Federal Independent MP for Wentworth Dr Kerryn Phelps told J-Wire: “I am calling for CCTV to be installed so that we can monitor what happens on the foreshore to try to ensure that this doesn’t happen again. There is no place for anti-Semitism or any form of racism in Australia. We are currently seeing a disturbing rise in hate speech and it’s important that as a community and as a nation we stand up against it. Vigilance is vital. The Wentworth community is united in its outrage and its condemnation of the events of the past few days. Just this week I had hundreds of emails and call to my office expressing distress about a vile mass email with homophobic, anti-Semitic and racist content that was directed at me and other members of the Jewish community. That email has been referred to the AFP for investigation and I hope we see those responsible brought to justice before the federal election on May 18. Once again J wire has given the graffiti vandal publicity. If the symbols were removed within an hour why even mention it here? On another matter a Get-Up representative was in ABC Radio Melbourne this morning (17 Apr 19) and was challenged by host John Faine as Get Up were saying in polling that Josh Frydenberg was part of the coup to oust Malcolm Turnbull. This is not true and the Get up fellow was evasive; even a “smart alec” in his replies to questions. The Get up fellow could not even get his facts correct saying that Frydenberg as Deputy PM and Finance Minister. The Nationals leader is Deputy PM and Frydenberg is the Treasurer.